"For the past 13 or 14 years, all the electrical work, from rough-in to finishing work, has been done by the 804 retirees. 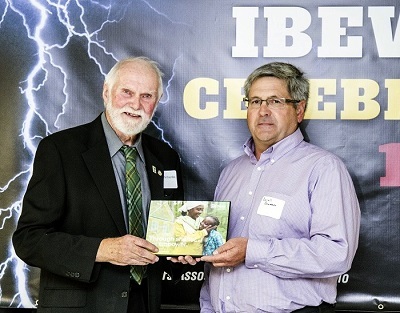 They are an integral part of what we do." 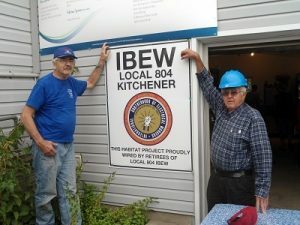 Since 2005, members of the IBEW Local 804 Retirees Club have been volunteering their services as licensed electricians for Habitat for Humanity WR home builds. They’ve helped over 65 families experience the joy of owning their own home. 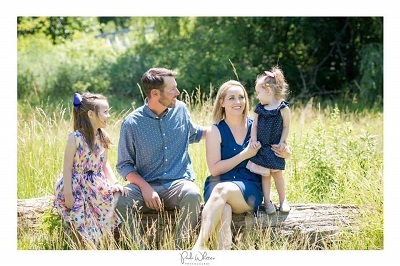 Jane Bleijerveld has noticed a big difference since her family moved into their new Habitat for Humanity Waterloo Region (WR) home. Life at home wasn’t always so pleasant for Bleijerveld’s family. 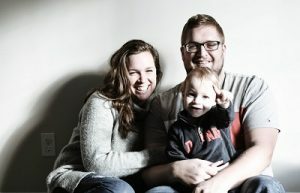 The rented apartment she previously shared with her husband Dylan and one year-old son was affordable, but not much else. But with all of their income going to pay student debt, car payments, and basic expenses, there wasn’t much left over to save for a down payment on a house. Cystic fibrosis primarily affects the lungs with ongoing infections, and exposure to normal colds and flu can be devastating. There is no cure, and the best hope lies in a lung transplant. Until then, Abigail needs attentive care which currently involves multiple medications and breathing treatments twice a day. For these families and others like them, Habitat WR gave them a chance to overcome the financial barriers to home ownership. A rigorous screening process, which includes providing a minimum of 500 hours of volunteer time, identifies families who will make good homeowners. It’s important to note that the families who are part of the Habitat for Humanity programme don’t get their houses for free. Habitat families don’t have to make a down payment or pay interest, but still need to pay the full cost of the mortgage. Even though the homes are fully repaid, running the Habitat WR program is still costly. While overhead for the program is covered by the Habitat for Humanity ReStores, having volunteer labour to build the homes is essential. Everything from the ground up is done by volunteers. 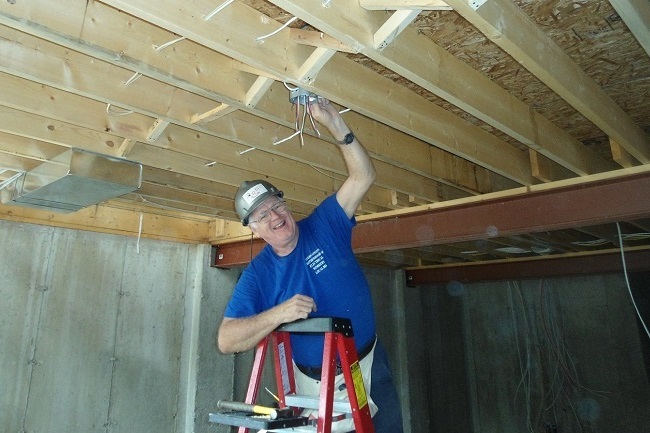 An experienced core team of volunteers helps teach the rookies, some of whom are Habitat families, but many of whom are people from the community who want to help. “You don’t need to be handy to contribute,” says Bauman. “It’s also a very fun place to volunteer. 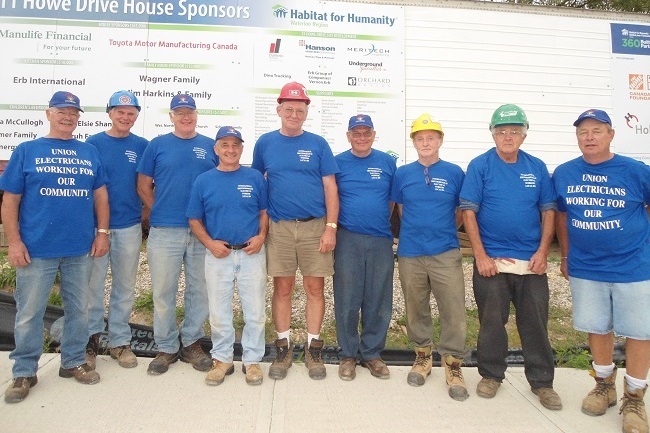 Some of the retirees from the northern part of Local 804’s jurisdiction have also been doing work for other Habitat builds in Wiarton and Cape Croker. But when Richards first started volunteering, getting essential systems installed safely wasn’t always a sure thing. Volunteer labour also results in one of the unexpected benefits of the Habitat program: showing people how good it feels to give. According to Habitat WR statistics, 89% of Habitat families continue to volunteer in the community after their 500 hours are done. Want to help out a Habitat for Humanity program in your area? Donate gently used home fixtures and leftover building supplies to a ReStore. Volunteer at a ReStore or a build site.